Size of Male: 12-18 lbs., 10-13 in. Size of Female: 12-18 lbs., 10-13 in. The Schipperke is described as small and foxlike and they do have a foxy black face and a mischievous expression. These little dogs became famous as the barge dogs of Belgium, where they kept watch on canal barges. These dogs are enthusiastic, joyful and sometimes willful, but they are also curious and want to be involved in whatever is happening. They’re very faithful and protective. They can make excellent family pets. This dog breed comes from the Flemish provinces of Belgium. They are not a spitz breed, despite having a foxy face like the Spitz and Pomeranian. They are a smaller version of a black sheepdog once found in Belgium. In the 19th century these 40-pound sheepdogs could still be found herding sheep in Belgium. 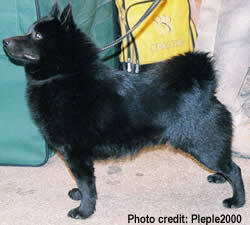 The Schipperke and the Groenendael (Belgian Sheepdog) are both descended from this breed. The present breed was bred down to its present size to become a small watchdog. However, small dogs of this type were known as far back as 1690 when a show for the dogs was held. Schipperke means “little captain” in Flemish. The dogs were very popular as canal boat dogs, though it was also popular as a watchdog with other workers. The dogs were also good at hunting vermin on boats. This is a a very bright and curious breed. They always want to see what you’re doing and find out what’s happening. They make excellent little watchdogs because they are so alert and interested in what’s going on. These are very active little dogs and they may become barkers if they are not taught to stop barking. It’s best if these dogs are receive basic dog obedience training from a young age since they can be willful and prefer to do what they want. Socialization is also recommended so they will be more accepting of strangers. They are high-spirited and confident. They are usually good with other dogs and they like children. These are very devoted and loyal dogs and they make great pets. Living Environment – These dogs are very adaptable and can make very good apartment dogs. They can have a tendency to bark so you will need to make sure they stay quiet. They also enjoy having a small yard and do not do well as kennel dogs. Grooming – Grooming for this dog breed is very simple. Brush them regularly to keep their coat clean and neat. They should not be trimmed. Diet & Exercise – These little dogs have normal dietary needs. Make sure you do not overfeed them since they can put on excess weight. They are active dogs and they require regular daily exercise. They should get at least a good walk every day. Health – Potential health problems include canine hypothyroidism, epilepsy, canine hip dysplasia, Legg Calve Perthes disease, progressive retinal atrophy, cataracts and MPS 111B (mucopolysaccharidosis). If you are interested in this dog breed you should talk to a breeder about possible dog health problems in the breed. In the dog training arena, the Schipperke is an intelligent dog and eager to please. They are considered very trainable, although they can be somewhat stubborn occasionally. Use positive dog training methods (praise, reward) and you should get good results with your training.